Here at Happily Ever After Thoughts I usually focus on romantic fiction, but this week I’m taking a side road to talk about nonfiction. 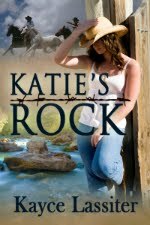 Actually, it’s about my article that was published in this month’s Romance Writers Report and I’m so excited about it! 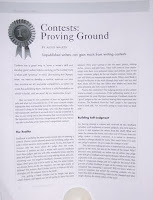 The article is titled “Contests: Proving Ground” and it’s about how writers’ contests can help a pre-published writer develop habits and skills that will stand her in good stead when she becomes a published author. 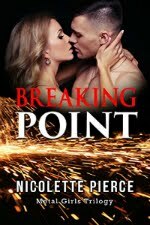 I’ve pasted the beginning in here, but if you want to read it in its entirety you can go to my website at http://www.alexiswalkerauthor.com/ and click on "articles." I hope you like it. Contests are a great way to hone a writer’s skill and develop good author habits as long as the contest route is taken with “practice” in mind. Like making the Olympic team, we need to develop a routine, exercise our muscles, practice our art, and enter competitions, so when we make the publishing team, we have a solid foundation on which to build and we won’t let our teammates down. But we must be very conscious of how we approach this path and what our expectations are. If we enter contests simply hoping our entry will pass the test of the first-round judges who will pass it along to the final judge who will then request the full manuscript, and love it so much they’ll decide to publish it, then we are losing out on the education that can be gained from the experience itself. Not every competition will be won, but we can take something away from every competition entered. Feedback is probably the most controversial area of entering a contest. Horror stories abound about the belittling judge who told a writer never to write another word. To me, this type of critique tells me more about the judge than the work. However, it amazes me that a writer will receive feedback from three judges and two will offer wonderful praise and the third will trash it. The writer can’t stop talking about, and, yes, obsessing over, the negative feedback. Granted, positive critiques don’t give you a lot to work on, but, for some reason, we always focus on the one negative. Are our egos really so delicate? For writers, they’d better not be, or trips to the psychologist will far outpace trips to the bank! Yes, getting a harsh critique can be tough, but guess what? Editors and agents are not all going to have the same opinion. They aren’t going to like the same genres, writing styles, voices, and plot lines. They will come to your manuscript with their own personal biases and beliefs, just as the many volunteer judges do for our chapter contests. Some editors will think my manuscript needs work. Others may think it should be thrown in the trash (though they won’t say so), and then, there will be that one editor who thinks my story has great potential and will want to publish it. Notice the similarity? The judging portion of the contest world is simply a microcosm of the publishing world. It is a competition for your Olympic manuscript. Feedback from the “good” judges is like our coaches sharing their experience and wisdom. The feedback from the “bad” judge is the opposing team’s trash talk. Are we really going to waste time on trash talk? Congratulations, Alexis! I saw your article in the RWR - can I get your autograph??? Great article, and it's inspired me to enter some published author contests to get feedback from readers. Feedback that I can use when editing and rewriting my future books.